Osmosis: ECG normal sinus rhythm. (2019, April 24). Retrieved from (https://www.osmosis.org/learn/ECG_normal_sinus_rhythm). Two very important pieces of information to obtain from an electrocardiogram are the heart’s rate and rhythm. Rate refers to the number of heartbeats in a minute, and rhythm refers to aspects such as regularity and pauses. 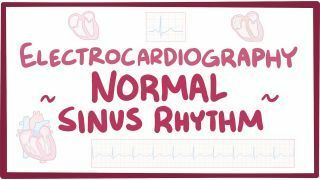 The term normal sinus rhythm (NSR) is sometimes used to denote a specific type of sinus rhythm where all other measurements on the ECG also fall within designated normal limits, giving rise to the characteristic appearance of the ECG when the electrical conduction system of the heart is functioning normally. Measured from the beginning of the QRS complex until the end of the T wave, the represents the duration of ventricular systole. An electrocardiogram - an ECG - or the dutch and german version of the word - elektrokardiogram or EKG, is a tool used to visualize “gram” the electricity “electro” that flows through the heart “cardio”. An ECG tracing specifically shows how the depolarization wave moves during each heartbeat - which is a wave of positive charge - looks from the perspective of different sets of electrodes. This particular set of electrodes is called lead II, with one electrode on the right arm and the other on the left leg, so essentially when the wave’s moving toward the left leg electrode, you get a positive deflection, like this big positive deflection correspond to the wave moving down the septum. To read an ECG it’s really helpful to first understand what a normal sinus rhythm looks like. To do that, let’s look at a single heartbeat on an ECG - from the viewpoint of lead II. In a healthy heart, everything starts at the sinoatrial node, or SA node, - which is a little patch of tissue in the wall of the right atrium full of pacemaker cells. When one of these pacemaker cells depolarizes, a wave of positive charge spreads outward and overall it moves from the SA node towards the apex of the heart, so it aligns pretty nicely with the lead II vector. Now, the heart muscle cells, are often described as having a functional syncytium because even though each one cell has its own cell membrane - the cells also have tiny connections or openings between them. That means that during a depolarization wave, ions can flow right from one cell to the next. Now - it’s also important to mention that the depolarization wave moves at two different speeds through the heart. In the pacemaker cells, which are special types of cardiomycocytes laid out like highways through the heart, it moves really fast, but it moves more slowly through the rest of myocytes which do the contracting - the depolarization wave moves through those like a car moving through congested small streets. The ECG measures out changes in time on the X-axis, where one small box is 0.04 s, and voltage on the Y-axis, with each small box being 0.1 mV, sometimes called 1mm voltage on the Y-axis, with each small box being 0.1mV sometimes called 1mm, with zero being called the “isoelectric line”. Every time there’s a positive or negative deflection away from this line - the isoelectric line. So a depolarization wave starts in the SA node, then goes through atrial intranodal tracts, also called Bachmann's bundle, over to the left atrium so that both atria basically depolarize together. The overall direction of that depolarization wave is in the same direction as the lead II vector, so there is a positive deflection called the P wave. Meanwhile, the signal also gets carried from the SA node to the AV node where it gets delayed for a bit, and this allows the atria to fully contract filling the ventricles with blood. During this delay, there is no depolarization wave moving towards or away from lead II, so this shows up as a flat line and the interval from the beginning of the P wave through this flat portion is called the PR interval. From there the signal goes through the pacemaker cells that make up the Bundle of His and into the left bundle branch and right bundle branches. In addition to moving through the fast pacemaker cells, the signal also goes through the slow myocytes in the interventricular septum, in a direction that’s slightly away from the lead II vector since there is a lot of this tissue and, and creating a tiny negative deflection on the ECG - a Q wave.